Newt Supporter: "We'll see in South Carolina"
The ballroom here at the Radisson hotel has yet to get really crowded, but Newt supporters in attendance remain enthusiastic. One supporter, Glenn Fiscus, is unsurprised with Newt's poor showing in New Hampshire saying, "Romney did a hatchet job on him in Iowa," referring to the attack ads run by a pro-Romney group in that state. When asked how he liked Newt's chances going forward, Fiscus nods knowingly and says, "We'll see in South Carolina." 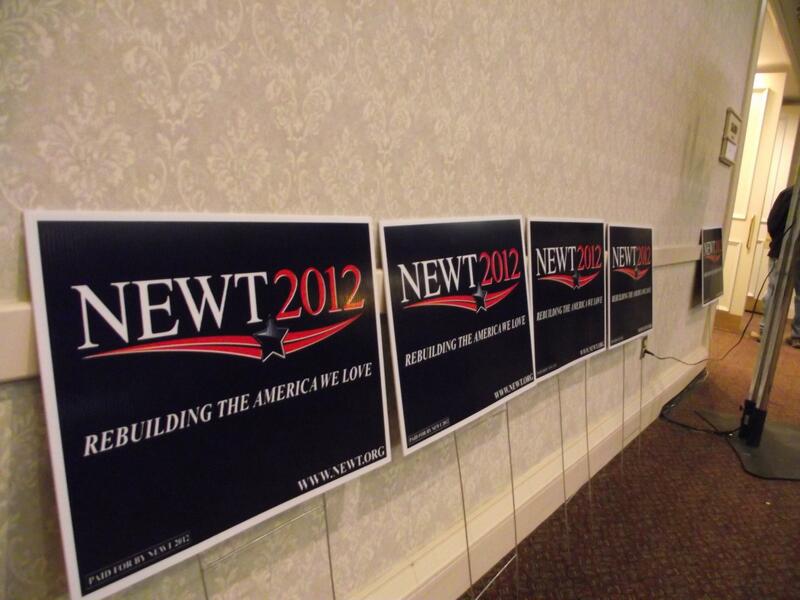 A pro-Newt group in South Carolina has spent $3.2 million on a negative ad campaign in South Carolina. Fiscus said of that campaign, "You gotta do, what you gotta do. You say negative, but you gotta say the truth."